I’ll admit it. In 7 short years and with two close in age kids, I’ve made a lot of mistakes as a mom. Some we’re bad judgment calls, others actions that unintentionally hurt my kids. The thing is we all make mistakes all the time and our kids learn to adapt and roll with them. Sometimes they’ll point out what you’ve done wrong but I find that the things that hurt my kids the most tend to be the ones they don’t talk about. Someone else made me realize what the biggest mistake I’ve made as a mom so far was and now that I’m working to fix my error I also wanted to share it with you. I love to read. Reading is one of my five favourite things in this world and number one if you take people and pets out of the equation. I’ve been known to find a great book or series of books and suddenly develop massive “migraines” that left me unable to function until I had read said book or series cover to cover (hello Hunger Games trilogy). Luckily, I married a reader who thinks this is more endearing than annoying. Will, who is now 7, is also an avid reader. As a small child, he would beg to read all day long. I remember some winter days in his first years where we literally read the entire Sandra Boynton collection at least twice. I can still recite the words and perform the dance moves of the Barnyard Dance. As Will moved into chapter books, I watched him head to bed and read alone. He would sometimes come into Charlie’s room for story time and then he would return to read his own books in bed. Recently I was sitting at a conference listening to the authors of a new book called Raising A Rock-Star Reader speak. As they began, I was actually feeling really good about myself. I didn’t need tips or advice as I had a 7 year old who had already read the first installment of Harry Potter and a 5 year who was well on her way to reading stardom. My heart sunk. Was Will feeling this way? Had I simply misread his eagerness to read alone as a sign that my job was done? I knew for the moment that my time as a functioning adult at the conference was done. I had to find Will. I got up from my seat and went looking for him in the day camp. I found him playing in the sand, laughing and running around with other kids. I ask to borrow him and we found a quiet spot overlooking the ocean. Will was giving me a look like I was about to tell him our dog died. I started the conversation lightly and then said “Hey can I ask you a question?”. He nodded. I simply asked him if he wished I still read aloud to him or he prefers reading by himself. He looked me straight in the face and said “I wish you still read to me but you only read to Charlie now” and his eyes filled with tears. All I could think was how the hell did I miss this? I asked him why he didn’t tell me and he answered with this: “I asked you to read to me after you read to Charlie but you always said it was bedtime and you were tired, so I stopped asking”. Now we were both crying. I apologized to my son and knew I had to fix this now before he became one of the kids who didn’t want to be read to anymore. And so I made a promise to Will on that beach that I would read to him for as long as he wanted. I asked about what books we should read and he said he would like to start by re-reading Harry Potter. Now that we’ve returned home, I have stuck to my promise. We have altered bed time by moving it forward an extra 20 minutes. Now Will and I or my husband read books to Charlie (she’s currently obsessed with the Mr. Men series) and then Will and I get into bed, cuddle up and read the beautifully illustrated Harry Potter and the Philosopher’s Stone. If you’ve made the same assumptions I have or have never read aloud to your child for whatever reason, the great news is that there is still time. In fact, Scholastic found that the number of kids wanting to be read aloud to stayed pretty consistent past 9 and in some cases all the way to the age of 17. Over the last month I have reconnected in a very special way with Will over all things Harry Potter. We talk about the rules of Quidditch, my absolute obsession with owls and Will’s distinct dislike of Snape (I can’t tell him yet right?). We make recipes and pretend they are potions and draw deathly hollow symbols on his chalkboard wall. The amazing part is Will already read this book alone once and I am now lucky enough to realize I am the one who missed all this. To pay it forward, I would like to send one of you an illustrated copy of Harry Potter and the Philosopher’s Stone to share with someone you love. Just click here and leave a comment on the photo. I will personally send it to the winner, wherever you are. *These stats and more are all from the Kids and Family Reading Report from Scholastic. I’m trying SO HARD to raise a reader but even though Stink is almost 3 she just doesn’t like reading or being reading to. I’m hoping as she gets older she’ll want to read more because I really can’t wait to start reading the Harry Potter series with her! Take a look at the Raise a Rock-Star Reader book and see if it helps. Its 75 ways to increase reading and a bunch of them are ideas for kids who have no interest in reading. A tip from the book is to have them write all the time. So if she wants something special from the grocery store, asking her to write her own smaller list etc. I’ve been doing that with Charlie and she loves it. Although we probably have enough cookies for a while now. Thanks Amy! Your love for the outdoors and adventure inspires me as a mother! I saw this at Costco the other day and it looked awesome!! What a beautiful post. My son is 18 months but growing more independent daily. Thank you for this timely reminder. My family loves books, and reading to my son is a cherished activity. I am looking forward to reading Harry Potter to him. 18 months is such fun time! I remember at that age getting the Harry Potter books ready. You know for 5-6 years later. Have so much fun for him and thanks for commenting! I remember reading that same piece of information in Jim Trelease’s book “The Read Aloud Handbook”… and yet have let reading aloud time slip with my 8 year old, a similarly keen independent reader. She asked me the same questions… “Why don’t you come and read to me? You always read to the twins!” but the truth of it, I’ve let reading aloud go for everyone. I’m tired… and I want to read my books 🙂 I’m going to make it a priority – go up 30 mins early and read to everyone! We’ve just started “A Wrinkle In Time” but I’m thinking I might do “The Lion, The Witch and The Wardrobe” as a better read aloud for everyone. Thanks for this post! Thanks for sharing. Looks like theres a lot of us in the same boat. The Lion, the Witch and the Wardrobe is a favourite of mine too. Loved this article, really made me think. My 11 year old loves reading but does read by himself going to see if he is open to me reading to him again…..I actually think he will enjoy it! I know I will. Great! I hope he does. Maybe pick up something he may be really interested in and ask if he would like to sit and read together. I’m sure he would love too. “past 9 and in some cases all the way to the age of 17” That made me choke up a little bit! My 15, 8, and I have been enjoying Narnia at bedtime for months but before that, there had been a long lull. I know I sleep better afterwards too. I remember when my oldest was little, there was always a huge stack of books on the floor by the bed (for nap and bedtime) from the library. Those are sweet memories. And I’m glad were making more! Awesome. Narnia is a great one to real aloud. I’m glad you guys are back at it too. Thanks for sharing! Thanks for sharing this touching story Sarah! I was amazed by those statistics at the conference too and they will certainly help me parent better too. You are wonderful to share this awesome new connection with Will. You are a terrific mom! I can’t wait to start reading Harry Potter to my little Harry! Thank you for this article. My son is turning 4 and loves to read and be read to. Like you, I thought I was doing a great job raising a reader as I too love to read. It hit home when you said that sometimes Will said you felt too tired to read to him or that it was bed time. I am guilty of the exact same thing. Thank you so much for making me realize this mistake early on. 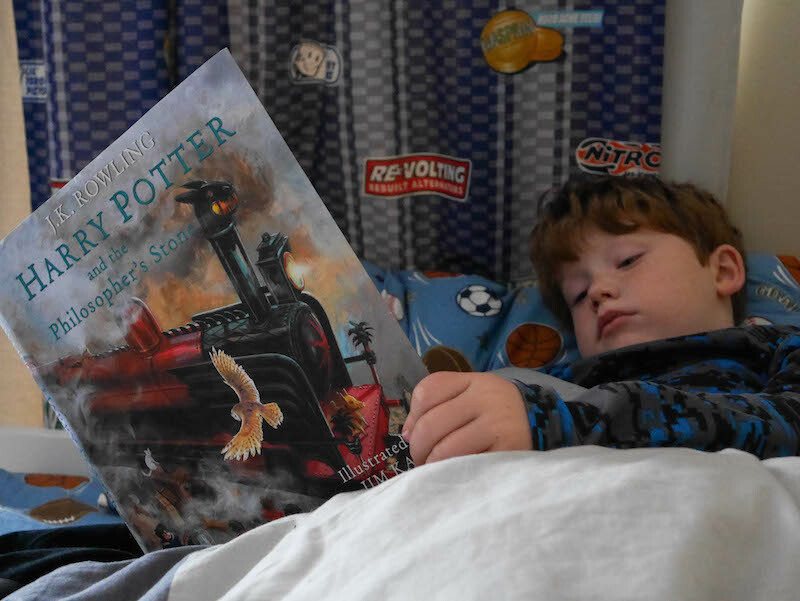 I thought too that Harry Potter might be too young for him, but you know what, I will buy the illustrated version and even just do a picture walk with him as I absolutely love this series. Thank you again. We all get tired! Glad Will spoke up finally though. Glad to now know what I’ve been missing. I am so impressed with your article. I have a five year old and I love reading to him every night. I hope that never changes! I loved reading to my 4 kids. I was reading the Left Behind series and I bought the books for kids in the series and every night I would read a chapter to them. We all loved that special time together. Now I read to my grandkids. My 8 year old grandson has Asperger’s and we were told he probably wouldn’t be able to learn to read very well. With the help of his teachers, we worked over the summer with him, I would sit with him for as long as he wanted and read and re-read the same books. Once he got it, he flew, he is now reading at a beginner 3rd grade level. He just asked me yesterday if we could start the Harry Potter series. 😀 Enjoy this time with your babies, I will always treasure the time I spent reading with my kids and now I get to do it with my grandkids. Thank you for sharing this incredible anecdote. I would love to know what he thinks of Harry Potter. What a great testament to the power of reading aloud. So glad the lightbulb went off for you after hearing Amy and Allison discuss their book and I thank you for sharing with your friends. My son left for college this year and it seems like yesterday, I was reading Oh the Places You’ll Go with him on my lap. Cherish your time together, especially the intimate times reading together. In what will seem like a second, you’ll be reading college brochures together. This post is beautiful, and I am so excited and invigorated by your kind words. When you know better, you do better, right? And believe me, there are MANY nights when I fall asleep during book reading–I’m so tired. We’re all doing the best we can, friends. That’s all we can do. Thank you for sharing this beautiful post. It means so much! Thank you for the post – thank goodness, some mistakes are, but I’m glad this one isn’t irreversible. To be sure, Will’s competition for Mommy’s attention and time may be as much behind this as his ‘unsullied’ desire to be read to, but who’s quibbling? I just want to point out, though, that the question of whether he wished you still read aloud to him, or if he prefers reading by himself, is the wrong question. It’s not a zero-sum game – he can read by himself and you can read to him. Have the cake – eat it too! Glad you brought that up! Will does still read quite a bit alone too. I guess that didn’t come across in the post. I agree. Both are very important. Thanks for commenting. Thanks for sharing your story. My 1st grader was so proud when he first read a chapter book, but by the third book he was ready to say “no more chapter books” because it had cut down on the time that I read to him. So now we take turns reading the chapters to each other. Sorry that the sad and smiley faces have moved! Sad face was supposed to be after “lazy” and smiley face at the end of my comment. Ps I am a Harry Potter fan, and can’t wait to get into the series with my son. Absolutely love that you went back to reading to Will! My oldest just now started wanting me to read to her but my youngest since age 1, he loves to read and loves reading 2-3books a night. What are some good chapter books for girls? Thank you. Thank you for making writing this book worth it. I was choking up reading this and am honored to have been able to help you and Will! I LOVE that illustrated edition as well and am trying to cajole my 9 year old into reading it with me. Thank you again for taking the time to share this – your post will inspire more parents to keep reading to their “big” kids. Lovely post — and older children can also read with the younger ones. Communal storytelling doesn’t have to stop at all, it can be just as relaxing between adults. thank you for sharing your story. As mom’s we can all find fault in how we raise our children. Good news is that we can course correct, or make it up with our grandchildren. I was not a reader with my son and as a result, he wasn’t a reader. He’s grown, married and has twin boys. I tell him often that he has to set the example and read because his boys will mirror what he does. Thankfully, he married a reader. This March I visited for a week to spend the boys 4th birthday with them. Crystal was reading Kate DiCamillo’s The Miraculous Journey of Edward Tulane to them, one chapter a night. The twins and my 32 year old son all sat listening, hanging on every word. Yes, 4 year old boys listening to a book, chapter by chapter, and each night asking, “mommy will you read one more chapter”. My mistake didn’t repeat itself with my daughter. We read to her every night. I too became a reader. She was reading at high school level at the age of 8. As she packed to head to college, one of her biggest concerns was if she would have enough room for her “must have” books. 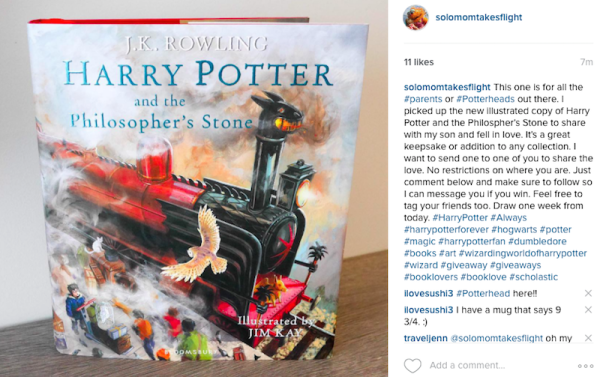 I love that you are gifting a copy of the illustrated version of Harry Potter and the Philosopher’s Stone. I’ve purchased 4 copies. Three to gift this Christmas and one for me. 🙂 Blessings to you and the readers in your home. I’m an avid reader myself and would love to instill the love of reading to my children. My oldest enjoys being read to, especially by my husband and I’d love for her to continue to have that relationship with him. I admit that my husband and I have fallen into the ‘I’m tired, it’s bedtime. No more books for tonight,’ and I don’t ever want to do that again. It’s eye opening how your perspective has opened mine and I now know looking that that my daughter was disappointed in not having more books being read to her at night. Thank you for sharing the post! We had a very similar situation w/ our oldest child. Luckily while on vacation we changed our bedtime routine to read out loud to both kids (5&8) and were really surprised what a bonding conversation/ dialogue it created w/ our kids. I love this post! I too am an avid reader, and wish the same for my children, 6 and 4. As an adult working with my mom, she’ll sometimes read something to me at work out loud for feedback/review. It always takes me back to being little, in her lap or cuddled up together, surrounded by books. I still read to our 9 year old and he enjoys it immensely. He will choose being read to time over screen time anytime, and he really likes screen time, but being read to definitely tops it. You reminded me of how fleeting these early years are and how much they mean. I love reading with my little one and am guilty of trying to rush because I’m tired. I’ll leave being tired for when she goes away to college and for now will enjoy our “us” time. I do love Harry Potter! So true! Reading before going to bed is a pleasure for all kids. I am so happy that you shared this difficult piece with other parents and caregivers! You made me cry! Reading aloud is one of my very favorite pastimes. My children had an early love of chapter books because if this. Their imaginations know no bounds! Thank you! Such a great piece of advice and good post. Luckily, we have continued this practice, but there are many nights we have not due to timing, etc. Great reminder. Thanks for the important reminder. I always wanted to instil a reader in my baby even before he was born! Your blog tell me the way to do this better! My son is 18 months and now gets his favourite book to me and indicates that he wants me to read it! I believe reading can help you in many ways…some bonding time with your children too, which I wasn’t aware of! What are the books one can read to 18 month old? Thank you for bringing me into the light. I now realize I’ve made the same mistake but still have time to fix it ? I am trying to set up the evenings for reading but it so rearly works out. I don’t recall my parents reading to me but my childhood was certainly full of books and I want my children to share in that magic. Excellent reminder, and I have only one child now, thinking of adding a second one. Mine is only 3, and she loves to have me do things with her. Sometimes I sayi can’t because I have things I need to do, but sometimes when I do, it was out of obligation. You’ve reminded me that it’s a beautiful time TOGETHER that strengthens our bond – how on earth did I miss that? I’m grateful to you for writing this article to remind us. Namaste. I’ll have to check out that Rock Star Reader book! I love reading and even was even thrown a library-themed baby shower, but my three-year-old is so heartbreakingly disinterested! OMG I totally relate to your article, I have a 9 year old daughter and 5 year old son. I’ve stopped reading to my daughter as she reads by herself but the exact same scenario has happened in our house, almost word for word! I am now feeling super guilty and will ask my daughter tonight if she would still like me to read to her! Thank you for sharing your story. This is such a good reminder. It’s so easy to let the older reader sort themselves out at bedtime when you busy with younger ones. Just recently I’ve been reading with my seven year old son again (normally his dad reads to him, while I read with Miss 4) and it reminded me it is about so much more than reading. We love the cuddles and the closeness and once I start then I generally for waaaay longer than I intended. I just have to resist the ‘it’s too late, I’m too tired’ temptation. My son is 5. we read together every single night and even though he can’t read quite yet I can’ wait for the day we can share reading duties. Way before I ready to have kids I hade been dreaming of the day that would read harry potter with my kids. Having this beautiful illustrated edition would make that moment all the more special. I don’t have any children but this article was wonderful. I remember years ago, I babysat a 9 year old. She had taken a book out of the library that day as a treat. I casually asked her would she like me to read it to her. Her eyes lit up, ‘really?!?! I would loved it. Mummy and Daddy never read to me anymore’. Her mother called me the next day to thank me for reading the book and to tell me she had spent the whole next day finishing it. That has always stuck with me as something to remember if I ever become a parent. The ability to do something independently does no correlate with a desire to always do it on your own in the future. Sometimes, things are just friendlier with two. Enjoy your special time. Wow, this was eye-opening for me. Upon reflection, I suspect my oldest would very much like to be read to. I’d love to start with this book. He and I are both huge Harry Potter fans. Very helpful to read. Thank you so much for sharing! My son adores getting lost in a book at age 9 but also still loves to be read to. Reading this is a great motivator to keep that up! And it makes me feel like all that time I spent reading out loud to high school students who never did their reading homework was maybe worth a little something! I love reading to my 3 girls…age 10, 7, 5. We make a trip to the library once every 2 weeks and we pick out their nighttime stories together. They have as much fun picking them as reading them. I just wish there were more picture type books for my oldest. Its so much easier to read to her when there are illustrations she can see but often the themes in picture type books are little too young for a 10 yr old. Ive found some but always looking for more picture books for older kids. Would love any suggestions on this! I have two children. One is five and the other is eight. Last year, when my oldest was in first grade, she used to read to herself at night. She would often be awake way past the time of her bedtime just reading her own books. Sometimes I would read to her, but most of the time she would read the book herself. My youngest entered Kindergarten this fall and part of her homework is for us to read to her for twenty minutes. When the year started, my oldest inquired, “You read to Addy. Why don’t you read to me anymore?” I thought about that question and said to myself,”Why don’t I read to you anymore?” I began to carve out a time in the night to read to her. I told her about the Harry Potter series and we started reading the book together. She and I became hooked on the books. I have read the books to myself before, but I had forgotten about how good they really were! We, too, have had some discussions about Lucuis Malfoy and Snape. It takes me about half an hour to get through each of the chapters in the books, but she and I are both hooked We are now reading Harry Potter and the Order of the Phoenix. Sometimes she will read past the chapter we read together, and then the next time we read we will reread what I have missed or go on. The other night she said that she did not want to read. I was kind of disappointed. Reading together has become our nighttime ritual. As an educator myself, I know how valuable reading to children is. I just never eally thought about it in terms of my own home. Once my oldest knew how to read on her own, I felt like it was okay if I didn’t read to her. Now I know how valuable it is to both of us. I love that special time when we are engrossed in a book. This is such a great post. I’m glad you are reading again with Will. You are making memories that will last a lifetime. Ok – now I have to go ask my almost 11 yr. old if she misses me reading to her! She has always read above her grade level and read such a variety of books (often more than one at a time!) that when she could read herself and wanted to read on her own, I just let her. My boys and I love Harry Potter! We just finished the last book… much to our sadness. It has been such a wonderful time reading with them each night, in the car, in my bed, wherever! I just hope they want to keep doing it until they move out! They are 6 and 9. I also raised a reader, and stopped reading to my son at bedtime when he started chapter books. He must have asked over the intervening few years to be read to but like you I also made excuses. At 10 1/2 he asked again and this time I listened. Happy to report a year later we are still reading nightly together snuggled up in his bed reading Harry Potter (book 4 now). It’s the moment of the day I look forward to the most, complete one on one time which is becoming more precious as he teaches the pre teen stage. We have plans to read the entire series before moving onto another series. Thank you for this reminder. I often read to my four year old but not his eight year old brother. I love reading to my step children before bed; they’re 6 and 2. This would be an awesome book to have! Such good advice! My kids have always enjoyed time spent together reading and now that they are older, I have let the “business” of life get in the way. I really need to make this a priority and return to our tradition! Thanks for the words of inspiration and reminder of how important this is to our children. Holy butterbeer! Thank you for sharing this important post. I’m also thrilled to learn there’s an illustrated Potter series. I’ve sent this page to my family to remind them of the importance of reading aloud, thank you! A beautiful and honest story, thank you for sharing. We love reading to our three year old and will remember this lesson as she gets older. You are 100% correct! As a teacher, I can attest that the children read to even as 4th graders have a greater love of reading, better comprehension, and the best expression. Making time for it in evenings after long days presents challenges for the adults, but the children are always ready. Thanks for the reminder! Thank you for this reminder. With a 4 and 8 year anniversary old, I struggle reading age appropriate books to both and still getting to bed on time. I asked my husband to read to the little one so I can read to the big one. He will read 3-5 pages and then I will read the same. We started reading diary of a wimpy kid but he read them at school and got way ahead of me. He insists i read the series myself, so I am. By myself. It’s an important series to him, so it’s important to me and then we can talk about it. We just started the first Harry potter together and I’m really excited. I have a 9 yr old boy, twin 6 yr old boys and a 1 yr old boy so reading aloud to all of them has become a little difficult, but i didnt want to give up on it, so I made a compromise with my eldest and we now read aloud to each other – he reads a paragraph then I read a paragraph – that way I still read aloud to him but I also get to hear his reading coming along too! Thank you for such a wonderful post. I.still read to my 9 year old, I have so many books I want to read with him that we may never stop. Have you heard of the book The Reading Promise by Alice Ozma? It is a memoir beginning when she was in 4th grade, she her father made a pact to read together for 100 days, but ended up continuing until she left for college. I hope your post inspires many parents to continue their reading adventures with their kids. I know for me, it is the sweetest part of my day. What a great blog post! My 3 year old son thinks he can read already. It’s so cute to see him look at the words on pages and mumble nonsense noises. We read to him each night, but even as a high school English teacher I had no idea that reading to him as he grew older was still important. Not only will I keep this in mind for my son, but I will share this with the other parents that I know. Thanks! I read to my nephews until they were 14 or 15. They still talk about me reading to them. My son just turned 13 and he is extremely disappointed if I don’t read to him every night. I love the interaction that takes place during this time, I find out a lot of stuff just listening to him after the story. The gift of reading, what a perfect gift!! I am going to start reading to my son again! Thank you!! I’ve always read to my boys. I’ve been slipping the last few months. Life gets in the way with evening activities-soccer, scouts, etc which push bedtime. But your article is a reminder to me to get back to that routine. Even if its a shorter amount of time on those nights. Thank you for that reminder! I would read to my adult kids now if I could. I didn’t make this mistake…but ONLY because when my kids were little my mom told me that she really regretted not reading to me after I learned to read on my own. And I was an early and avid reader as well. I made it a point to always read to my kids. Big books, silly books, chapter books, you name it, we read it. I’m so thankful for that time with my kids and glad that you were able to discover the importance of continuing that tradition with Will while he’s still young. Just think of all those moments you’ll have together from this point forward. Love this! We still read aloud as a family with our 6 and 8 year olds because I love that time, but sometimes I’ve wondered if I should encourage them to read on their own then instead. I’ll let them read on their own all the other times and keep our family time. 🙂 I’d love to introduce (and read myself for the first time!) Harry Potter! My son is 10 and he still likes me to read to him. I don’t do it as often as I should. I like you love reading. He would love this book! This has come at the perfect time for me, fortunately. My eyes began to tear up as I read about the conversation with you and your son. My daughter will be turning seven in two weeks and she is now beginning to read on her own, in her bed, by herself while I read to her four-year old brother. I will also make a commitment to keep reading to her and I will start with this book!! Just the other day, she asked for “a book with chapters, that had magic or fighting. A rich book.” Can’t beat Harry Potter, right? Thank you. Thank you. My daughter is 9 and I didn’t think of this at all. In fact I tell her no a lot or dismiss her without meaning to. Thank you. It won’t happen again. We are definitely reading tonight. What an eye opener, my husband reads to the baby daily while I clean and get things ready for the morning. Meanwhile the 7 year old reads to himself. I will have to incorporate this moving forward. Thank you for this article and sharing with us all. What a great story! I love that you are reading to him again. I had read in books that you should continue reading to children even after they can read. I was never read to as a child and grew up hating to read. I’ve only recently found my love for reading. So I knew I would read to my children from the day they were born. Great article Sarah, you’ve reminded me how important the small moments are. Ok, This was actually hard to read. I think that I may be in the exact same position and will be checking upon my return home. It’s amazing how much we pull away as parents when we feel that it is something they can and want to do for themselves. It’s time to start asking them, to a point of course, you don’t want to coddle them, but this isn’t that at all. Thanks for this! My kids recently asked me to keep reading to them, too! Somehow that daily ritual disappeared from our routine and I just assumed my 8 and 6 year old were too big for this. And I’m an elementary reading teacher! This was a good lesson to learn. It makes me stop and think about assumptions I make about my kids. I plan on reading my daughter Harry Potter soon. I’ll make sure we don’t stop story time until she asks. Thank you fir sharing this story. My children are 14,11, and 5. I too stopped reading to my older children. They miss it too and I want to find a way to re-connect. This was a great reminder of how precious our time with them is. I am so glad I stumbled across this blog. My son is not long 5 and in the throes of discovering reading words for himself and is thoroughly enjoying it. I am so grateful you posted this as I also have a daughter 18 months younger and I too would probably have let him go solo with the books whilst continuing to read to his sister. Having read this I will make sure I continue to read to him until he doesn’t want me to. My daughter would love this. I will have to look for it. Thank you for this post! My sweet boy, 8, still loves to have me read to him. But my darling daughter stopped having me read to her right around her 10th birthday. I still remember the book; we were in the middle of the 7th book of the 39 Clues series. It broke my heart. Though she sometimes listens in when I read to her brother, so I think she misses it, too.